I really opened a can of worms for this month's monthly eNews email (so much so that it is a few days late). Over time I have accumulated some feedback, some research, and some more ideas that all need to be incorporated into the eBook Articles in the Share Market Toolbox. And when I started to do that a couple of weeks ago for the latest eNews email, I discovered there was a lot of work involved. Anyway, it's done now, and the results are described below. One of the key things I have done is to better collate the growing archive of past eNews emails. And I now have a new eNews email archive web page in the Toolbox which lists them all, with a brief introduction to each month's topic. This will be very useful to people who are new to this, as they can step through the email from each month, and see the relevant reference materials on each topic. Just a short note to the recently new Toolbox Members:- This eNews email is a monthly email with some pointers and tips on focused topics. You can see a quick introduction to the eNews emails here. They often include references to specific eBook Articles in my Share Market Toolbox, as well as key web pages in the free area of the Toolbox (eg. on the extensive Share Market web page). I have been writing the eBook Articles since October 2008 - that's now more than 3 whole years, and these eNews emails help you to navigate to related information. This month's eNews email is going to all Toolbox Members as normal (a part of the Toolbox service), and to the people who have registered to receive occasional information about the Share Market. Any non-member who no longer wants to receive this material can simply unsubscribe from all topics using the SafeUnsubscribe link at the bottom - or just Update Your Profile to change the interests. This month's eNews focus is on the topic of proper preparation for successful investing or trading in the markets. The central focus of this is the updated Are you Share-Market-Ready? web page. And there are some eBook (PDF) Articles. 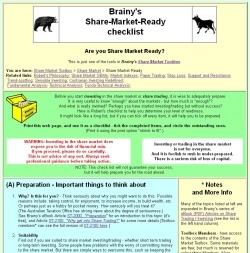 The Share-Market-Ready web page is a detailed check list of items with links to many other resources to help us prepare for investing or trading in the markets. It is divided into several major headings including: Preparation activity, Getting ready, Risk management and money management, Pulling the trigger, and some strategies. You can print the web page check list, and then refer to it, and work through it, and tick off items as they are completed. The eBook Articles now include a new one that gives an introduction to the Preparation topics, and some updated Articles, including a discussion of the discretionary trading approach. This is what a lot of people do when investing in the markets, and they do it without realising it. And they also don't realise that without sufficient education and preparation this approach is doomed to lead to failure (ie. to a loss of funds). And this is what actually happens to a large majority of investors/traders who plunge into the market without enough preparation. Revised Share Market Ready? web page. Article ST-2000, "Share Trading Preparation", a new single-page introduction to the bigger subject of investing and trading, outlining a sound preparation process (free to all). Article ST-2400, "Trading Style, Plans and Strategies", an updated 4-page Article now free to all, and explaining why proper planning and a strategy is so important to help protect our investment capital. Can you really afford to ignore this? Article ST-2410, "Trading Styles (and Styles Worksheet)", or the free page 1 (this is an updated 6-page Article). This Article includes a good description of key differences between an investor and a trader (as well as a reference to the Australian Tax Office definition), including a discussion about how the term trader can also be used to refer to short-term investors. Also includes a discussion about discretionary trading, and how this can lead to failure if you are not well prepared. There are now a total of 119 Articles in this collection of eBook Articles - a total of 510 pages of information! You can see the Master List of all Articles here (recently new or updated ones are highlighted), and the Detailed Topic Index here.